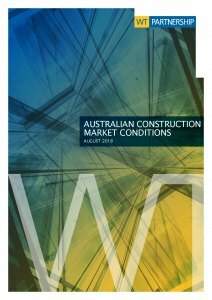 WT Partnership (WT) has launched its Construction Market Conditions 2018 report summarising trends in the construction industry for each state and forecasting tender price escalations. According to the report, the national construction industry remains buoyant across the eastern states despite some slowing in residential construction. “While we are experiencing the end of the residential boom, infrastructure projects across the country continue to drive the construction demand. The industry is thriving with commercial vacancy rates tightening throughout the states, the rise of e-commerce fuelling warehousing construction and refurbishments in shopping centres and also a strong growth in entertainment, recreation, hotel and resort development,” says Nick Deeks, Managing Director of WT. Are we getting risk wrong in public-private partnerships?